Record Today. Keep a personal diary and keep track of day to day activities, thoughts, goals, feelings, dreams, ideas and important events. Even include embedded pictures to capture special memories. Look Back on Yesterday. Search years, even decades of entries with lightening speed. Filter entries by words and phrases like people's names, places you've been or things you've done. Find What You Need, FAST. Search years of entries in the blink of an eye. Use filtering to find entries containing words and phrases. Even combine phrases using OR, AND, LIKE, NEAR and wildcards. Our diary software has been around for over 20 years now and used for just about any purpose imaginable and pushed to the limits on many occasions. 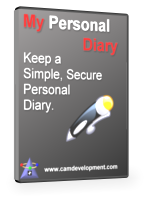 You can rest assured that your personal diary data is stored securely and will accessible for years to come with My Personal Diary. My Personal Diary is simple to use, but that does not mean it is not powerful. Edit entries by changing fonts, colors and styles, and by adding pictures. Search entries for combinations of words or phrases and even use fuzzy matching. Print a hard copy in a variety of formats. We know your entries are important to you that's why our diary keeping software gives you the option to securely encrypt your entries with a password. Without the password you specify, no one, not even us, can access your diary. Unlike some other similar products, we don't charge extra for this important feature. "I am so impressed with My Personal Diary that I have recommended it to all the people in my reading club. A lot of them like to keep a diary." "I have thousands and thousands of entries in My Personal Diary and have never lost a single one. Whatever you guys are doing, keep it up!" "I have been using the old version of My Personal Diary for year. Now it's even better!" "I love the simplicity of My Personal Diary." "My Personal Diary is simply the best!"